The city has two mines, Iron-Breaker Mine and Quicksilver Mine, which supply iron and quicksilver respectively. It is home to many fishermen and is an important port. An ancient Dark Brotherhood sanctuary is located beneath the city. A small, isolated ice cave once connected into this sanctuary after its abandonment, and served as the lair of an Udefrykte. 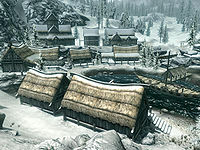 The White Hall, a large longhouse located in Dawnstar, is the seat of the Jarl of the Pale. The Tower of Dawn, also called Nightcaller Temple, is a ruined military fort often used as a place of worship which sits upon a cliff top overlooking the town. A small lighthouse sits atop a hill just east of town. Dawnstar is neighbored by several settlements, including Helarchen Creek to the southeast, Stonehills to the southwest, and Winterhold to the east. It was after the destruction of a fortress in Dawnstar during 2E 283 that Potentate Versidue-Shaie declared martial law, leading to one of the most brutal and bloody periods in the history of Tamriel. At the end of the Third Era, Dawnstar's Queen Macalla married Thian, king of Solitude, as part of an expansion of Solitude's power in northern Skyrim, leading to an alliance between the two city-states. Dawnstar was once besieged by the mysterious Ice Tribes. The town's four champions—Chung, Delacroix, Beatrice and Alhavara—attempted to negotiate with the tribes, led raids against them and turned to the Emperor for help, but to no avail. The tribes attacked the town, and the walls barely held. Governor Cyril Vinticae banished the champions, rightfully fearing that one was in league with the tribes. The tribes were mounting for a final attack, when a disgraced hero was assigned to defend Dawnstar. The governor promised the hero riches and would restore their good name if they could reveal the traitor. With the help of the oracular powers of the town's healer, Eustacia, the hero tracked down the four Champions in the many dungeons around Dawnstar and pieced the clues together to reveal the traitor. When the tribes led the final assault, the hero slew any enemies who slipped through the defenses. In the final battle, armed with the power of the Starfrost, the hero defeated the thriceborn Gehenoth and saved the town. During the Imperial Simulacrum in the late Third Era, the city-state of Dawnstar was an active settlement, being ruled by King Ulrarne. It had a rivalry with Whiterun and Winterhold. In 4E 201, the Jarl of Dawnstar was Skald the Elder, who led the city in the support of the Stormcloaks. Skald's subjects suffered from chronic nightmares due to a curse put upon them by Vaermina's Skull of Corruption from within Nightcaller Temple, a curse which was lifted by the Dovahkiin and a former priest of Vaermina. In the same year, the abandoned Dark Brotherhood sanctuary became inhabited once again, and was the last refuge of the now-crippled guild of assassins after all other sanctuaries were sacked or abandoned. The connecting ice cave was resealed and the Udefrykte within was slain. The city was susceptible to dragon attacks, as all of its structures were made of wood and the town walls had long since fallen. For game-specific information, see the Arena, Dawnstar, and Skyrim articles. This page was last modified on 17 March 2019, at 16:06.